In 2017, the BC government announced an end to the trophy hunting of Grizzly Bears in the Great Bear Rainforest. Ending the coastal trophy hunt has been part of the Raincoast Conservation Foundation’s efforts to protect the habitat and life requisites for grizzly bears, and other life carnivores, in the Great Bear Rainforest for over two decades. Raincoast, with the support of Coastal First Nations, has since struck a deal to buy a fourth trophy hunting licence in the heart of the Great Bear Rainforest. The exclusive commercial licence covers an area of more than 2,300 square kilometres of rich habitat for large carnivores, including grizzlies, black bears, Spirit bears, wolves, cougars and wolverine. 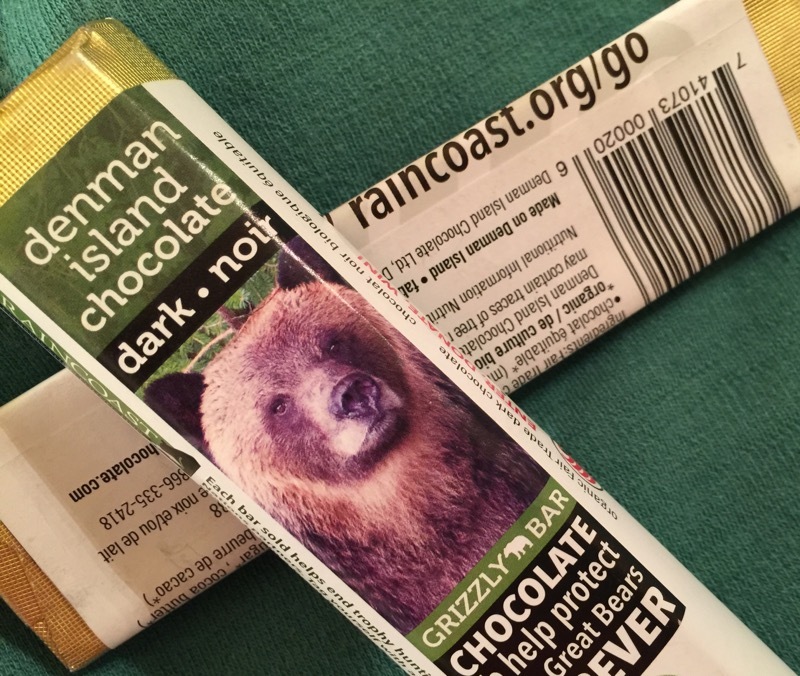 To help pay for this licence, Raincoast has been running a campaign, Save the Great Bears, to raise the required $500,000, which includes the purchase price. The funds must be raised by Dec 31st, 2018. Raincoast’s acquisition of this tenure will ensure a permanent end to all commercial trophy hunting in some of the most spectacular watersheds on BC’s coast. Purchasing the remaining commercial trophy hunting rights in the Great Bear Rainforest, coupled with the province’s ban on grizzly hunting, is a significant step towards their goal of ending all large carnivore trophy hunting on the coast. The sale guards against future shifts in government policy that could reverse the ban on grizzly hunting, while also ensuring that trophy hunting interests cannot continue the recreational hunting of black bears, wolves, cougars or wolverine. #2. 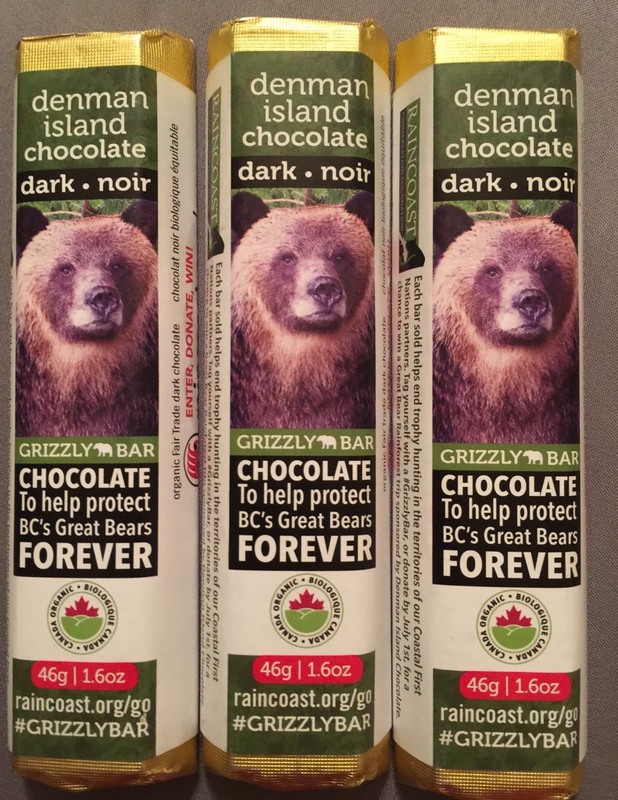 Buy a (very yummy) Denman Island Chocolate Grizzly Bar – available at select locations across Canada. Click here to find the location nearest you. On behalf of the Grizzly Bears in BC…thank you! Maryanne Pope is a long-time supporter of the Raincoast Conservation Foundation. She is the author of A Widow’s Awakening, the playwright of Saviour and the screenwriter of God’s Country. Maryanne is CEO of Pink Gazelle Productions and Chair of the John Petropoulos Memorial Fund. If you would like to receive her regular weekly blog, please sign up here. As a thank you, you’ll receive a short but saucy e-book entitled, Dive into this Chicago Deep Dish – Ten Bite-Sized Steps for a Yummier Slice of Life. A really good cause and it’s great you’ve shared this on your site. Thanks, Elliot! Raincoast does some excellent work on behalf of Canadian wildlife.